The Atlantean Conspiracy: Alex Jones Admits the Truth About His Cointel Operation! Alex Jones Admits the Truth About His Cointel Operation! I thought Alex Jones believed in the moon landing hoax, here is a clip from msnbc where Rachael Maddow is attacking Jones and shows a clip from him talking about the moon landing conspiracy. Also as I was researching the other side of the moon landing hoax I came across this site which does a very thorough job of debunking the conspiracy. What is your opinion on their counter arguments? Hi, what a pile of hooey. Alex Jones is a good man exposing the truth. It is so obvious that you chopped up his words and tried to do such a thing. Shame on you for firing on a man that is only trying to help us all. Do you think this is a joke? He has documents, and God help you when there is a jack-boot tramping on your face. Just hearing Jones say the words "atlantean conspiracy" in the context he did confirms he knows exactly of this page and you aswell Eric. It truly disappoints me that we may never ever know the truth about the moon but it disappoints me even more to know that people still cannot see past Alex Jones and other shills alike. Sometimes its extremely difficult to keep the positive energy flowing knowing these certain individuals keep "poisoning the well of truth". Keep posting Eric! Your articles and books are extremely helpful! I'm currently halfway through Spiritual Science and am truly benefiting from the perspective change. Peace and love bro! HA HA HA. HA HA HA. The day I go to outer space most likely for astro/eco/agricultural related work or when a public properly footaged moon hotel opens up that will be the day that I beleive in the moon landing. I just think these partial hoaxes go way back--even to the moon landing. I believe the astronauts really did go to the moon, however, they also staged a simultaneous "photo shoot" IN ORDER to hide alien bases found on the moon, but REALLY sending the astronauts to set up the elites' bases on the DARK SIDE OF THE MOON. I think they have been playing 2 sieds to every thing they do, because this keeps the public guessing about what really is truth. This is their deception--to PLAY 2 SIDES. And it works too because I see the conspiracy theorists argue that all these events were hoaxes, and I see the mass public believing (and fearing) these events as real. And as an added bonus for the elites, they again divide (the conspiracy theorists with the mass realists), and they can come in and conquer us. Weidner, an isider with Kubrick, says Kubrick filmed the faked mon landings. So they put the Masonic flag there in the studio. Ha-ha-ha. However, there is good reason to believe we have bases on the moon and have for a very long time. Using highly advanced technology, not the nonsense pedaled to us. Indeed, I remember in the course of a meteor bombardment some years back the NASA website briefly registering (of course it was quickly removed)concern "for the personnel on our bases on the moon" or something close to that. 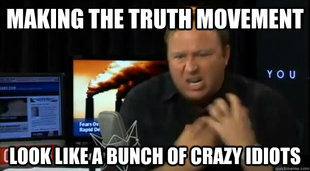 Well I have to give it to Alex, cause for years he has done a great job making everyone with critical thinking look like a psychopathic lunatic. Yes people there is some truth in what he tells you, but you have to remember it's 90% DRAMA and he just runs with it, like Bill Cooper exposed him over 10 years ago. I learned far more about real truth from guys like Eric and others that do stuff for FREE and aren't constantly trying to profit off it. That's the one red flag that waves about Alex Jones. He makes so much money off selling his stuff "buy my DVD's buy my books!" that you have to think for yourself, deep down he's got to be a disinfo agent, otherwise they wouldn't let him break this stuff out. That's why he runs all those strings of drama rumors down your throat. He seems to consistently say that he believes they did go to the moon, but that what was sold to the public was a hoax to make it tv friendly, that a lot of other stuff went on. Even the astronauts themselves admit there were sightings, encounters, etc. I'm no expert, but I've been watching Alex Jones a long time and although he isn't perfect, I don't think he's cointel pro at all. He's also not Bill Hicks, aside from the fact that they both have/had two arms and legs, two eyes, and were humans that smoked tobacco... I can't see any other similarity. Eric dude, a lot of Jews are fully awake to the zionist conspiracy, and they don't like it. If you don't like the way he's doing it, do it better. He also started with little. You show you can hold up a fort, keep up the pace consistently year after year and get listeners and deliver stuff they would never hear on the msm, you'll get some sponsors too, and yes, some of them might be Jewish (heaven forbid!). They're people too you know. The Zionists, not so much, admittedly. I've seen evil white people, evil black people, evil Jews, evil Chinese, evil Japanese, evil Thais. I've seen the good of all of those, and in much greater numbers than evil. If you don't like the way he's doing it, do it better. Yeah, I do. Thanks. Been doing this for over 6 years now, how about yourself Anonymous? Bill Hicks is Still Alive! And I'm aware that Jews against Zionism exist, and that evil psychopaths come from every level and sector of society. Your comment shows you haven't been reading my material for very long, but rushed to judgement on several issues.